Shower Stools and Bath Chairs, Wall Mount Shower Stools, Folding Bath Chairs, Bath Chairs With and Without arms. Scroll down to see our selection of Shower Stools and Bath Chairs for sale. Shower stools and bath chairs are products used by people with difficulty standing for prolonged periods of time to bathe. We carry a large selection of shower stools and bath chairs including shower stools without arms, bath chairs with arms and backs, folding shower stools and bath chairs, corner shower stools and wall mounted shower stools. 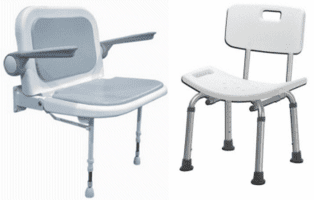 Shower stools and bath chairs are devices for patients who can not safely use a regular bath tub or shower. Shower stools and bath chairs are stationary equipment typically with a back, arms and sometimes padded seat. In the home or facility a shower stool or bath chair allows to user to bathe while seated, reducing accidental slips and falls. Shower stools and bath chairs are light weight and can easily be removed. Some models of shower stools and bath chairs fold for easy storage or transport when traveling. Wall mounted shower stools and bath chairs fold flat allowing others to utilize the shower as well. A shower stool or bath chair is one of the best investments you can make for bathroom safety because this is where a majority of falls occur..